Whether you’re traveling for work or leisure, sometimes you could use a touch of home. Even if you’re not staying at a hotel, no matter how finely appointed your short-term rental is in downtown Toronto, it’s the personal touches that turn a house into a home aren’t a part of the design. But while renting means that you can’t paint the walls your favourite shade of purple, here are five simple (and practically instant) solutions for adding a little character into virtually any living space. While short or long term residential living means you probably don’t have your children, partner or pet waiting for you at the end of the day, that doesn’t mean they can’t greet you when you walk through the door. By using your favourite photos, you can create an instant gallery as a focal point in your living room, along a hallway or at the front entrance. Although a collection of inexpensive frames work well for a table top gallery, if you’re short on surface space, consider using a collection of bright coloured peel-and-stick wall frames. You may not realize it, but familiar smells and sounds can make you feel at home in your downtown Toronto furnished rental, even when you’re not. 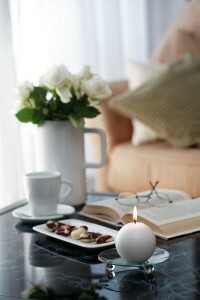 By incorporating a few scented candles into your space, you can enjoy the aro ma of freshly baked cookies without turning on the oven. For many of us, music is an integral part of our lives which means that by simply loading your iPod into one of the docking stations in your suite, you can listen to your favourite tunes, should you decide to actually bake those cookies. For practical purposes, hardwood flooring adds instant appeal in rental properties but sometimes your toes need something to sink into. Whether it’s a simple mat in front of the kitchen sink or a throw rug at the foot of your bed, accessorizing with small or medium-sized floor coverings in your DelSuites apartment rental space is an easy and low-cost way to add comfort. You don’t have to be an interior designer to realize that reflective surfaces will brighten a room. Whether you choose glass frames or add a mirror in your entrance, the reflective nature of these surfaces means that you’ll instantly add more light to your space, which instantly makes it more inviting. Even if the main living space in your apartment isn’t well illuminated, you can maximize what you do have, by adding accessories that reflect the natural light. When you need to rest your weary head, there’s nothing like having the comfort of your own pillow. Even better, having your own pillow-top mattress pad to cushion your whole body. Although you may not be able to travel with your own pillows and linens from home, it may be worth investing if you’re going to be traveling on a frequent basis. While the changes may be small, it’s often the little things that add the most impact in your day to day. After all, no matter where you go, having a few familiar comforts of home can bring new life and energy to both you and your space. When many of us think about life in the suburbs images of tranquil tree-lined streets, minivans loaded with children and a wealth of chain restaurants probably come to mind. While it’s true that you’ll find multiple family vehicles in the driveways, not to mention multiple East Side Mario locations (5855 Rodeo Drive and 3075 Argentia Road) you’ll also find that Mississauga offers plenty of locally owned eateries and trendy shops and so much more. 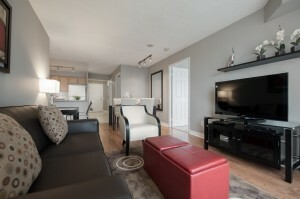 Think a suburban setting is ho-hum, Mississaug a’s anything but; seriously, we’re not kidding. Beyond the sleek modern style of the fully furnished suites, you’ll enjoy the amenities of a downtown lifestyle when you’re living at the Grand Ovation. In fact, its central location offers guests all the perks of metropolitan living including live theatre, music, galleries and fine dining in one destination. 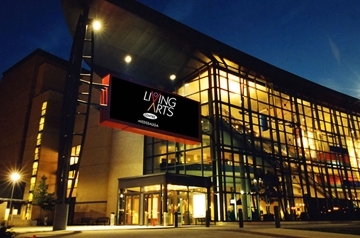 Celebrating its 15th Anniversary this year, Mississauga’s Living Arts Centre serves as the city’s central hub for arts, education and business. Housing several performance and gallery spaces, the Centre also features artist studio spaces and offers classes for all ages. While the Centre is home to the Mississauga Symphony, the two signature performing arts venues, Hammerson Hall and the RBC Theatre, host a range of national and international artists and events. Along with resident artist exhibitions, the Gallery functions on an annual schedule with approximately seven rotating exhibitions. Intended to foster the growth and development of local artists, the Gallery offers priority to local artists, which means that patrons will enjoy the works from a vibrant artist collective. As an added bonus, LIVE restaurant, located on the Centre’s main floor of offers an exceptional dining atmosphere. By day, the restaurant’s expansive windows filter in an abundance of natural light, but as the sun fades, the warm tones of the interior offer an intimate evening vibe. Even in the heart of suburban life, Mississauga is proving that you can still enjoy a cosmopolitan lifestyle. With the arts, theatre, dance and fine dining, all a short drive or walk away from the Grand Ovation short term rentals, you’ll discover that this suburban location just might trump downtown dwelling. With the sub-zero temperatures in the Greater Toronto Area, now’s the time to enjoy the snowy weather by taking part in some of Canada’s favourite pastimes. In fact, Mississauga, a suburban city situated west of downtown Toronto offers plenty to see and do during this time of year. 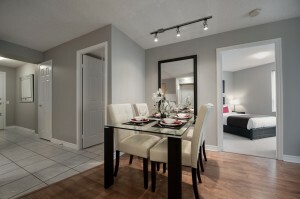 From ice skating and hockey to skiing and snowshoeing, exceptional outdoor recreational activities are conveniently located within a short distance of the City’s centre and DelSuites short term rentals in Mississauga. Exploring the scenic natural surroundings is an essential part of life in Mississauga. In winter, when the City’s trail system is blanketed in snow, cross-country skiing and snow shoeing are must-try activities that over a picturesque view of the city. Outdoor public ice rinks are also a wonderful way to enjoy the outdoors during the colder weather season. In fact, Mississauga’s prime outdoor skating venue is at Celebration Square(steps from City Hall) offers open skate times along with rentals throughout the winter season. But if you’re more interested in staying warm, Mississauga’s indoor ice rinks are conveniently located throughout this suburban community. While hockey fans are thrilled to see that their Toronto Maple Leafs are back in action, the Air Canada Centre isn’t the only place you can catch game time. In Mississauga, the Steelheads regularly take to the ice at the Hershey Centre and when the puck drops, the speed of the game definitely keeps the on-ice action interesting. As an Ontario Hockey League (OHL) team, the Steelhead’s features a talented roster of up-and-comers, offering fans the opportunity to experience the excitement of the game. Along with being home to the Steelheads hockey club, the Hershey Centre includes SportZone, a public recreation facility that includes indoor soccer, flag football and dodge ball leagues as well as dance and other fitness programs for all ages. It’s also the venue of choice for a wide range of entertainers from pop and classical musicians to comedic performers and children’s entertainers. Whether you’re visiting Mississauga for an extending stay with DelSuites furnished apartments in Mississauga, even during the colder weather season, there’s plenty of excitement. And while it’s wonderful to settle in to comfort and warmth during this time of year, by exploring all the city has to offer, you’ll find your return home that much sweeter. With newly designed furnished apartments, Mississauga’s Skymark West has hit the mark for guests who favour a contemporary aesthetic. Beginning with a neutral colour palette that includes a light grey shade along with deep chocolate brown and cream furnishings, the suite’s main living areas including the living room, dining room and kitchen offer a warm and inviting atmosphere. In this open concept living and dining room, light and dark shades complement the space where cream dining room chairs and accent chair contrast the rich espresso dining table and leather love sofa-bed respectively. With designer furnishings that feature sleek lines as well as reflective glass surfaces, guests will instantly appreciate the bright and airy feel that expertly reflects Skymark West’s outdoor environment. Using accent pillows and artwork, the design team was able to inject pops of brilliant cherry red which is a key element in creating the suite’s contemporary atmosphere. At the same time, the subtle yet graphic style of the suite’s artwork offers a modern compliment to this contemporary space. In the living room, moveable leather cubes provide additional seating which can be easily double as side tables or moved to another area when not in use. In the bedrooms, a relaxing retreat awaits guests where crisp white linens complement the clean lines of the bedroom furniture, while hypoallergenic pillows and duvets are a welcomed addition for guests. The suite’s bathrooms were also redesigned in an effort to create a consistently contemporary feel throughout. 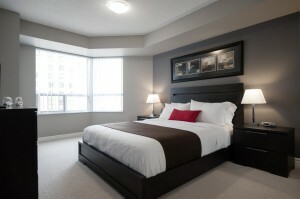 Beyond the fresh interior designs at Skymark West, these short term rentals in Mississauga are now equipped with up-to-date technology such as iPod docking stations and high definition, LCD flat screen televisions in both the living room and master bedrooms. In addition guests can also take advantage of high definition digital cable packages that will guarantee your viewing enjoyment of the latest movies, television and sports. Although the building amenities and services at Skymark West remain the same, you’ll enjoy the fresh new look that can be found when you open the doors of one of these newly designed suites. Whether you’re an out-of-town guest or a local in need of temporary residence, it’s the little details that really matter most. From arranging transportation from and to the airport to ensuring you receive a clean, well-appointed furnished apartment, the DelSuites Guest Services Team are keenly aware of the details that can make or break your experience. As Erin Conaty, Guest Services Manager shares, “we offer guests’ personalized service with a friendly face.” This means you’ll not only receive a welcome greeting, but you’ll also receive a complete suite orientation by a Guest Services team member if requested. Similar to a hotel’s concierge, the Guest Services Team are available to quickly source the items you may have forgotten and can assist with recommendations for local area restaurants and attractions. Even before you put your key in the door, our Points of Perfection program makes it possible for the Guest Services Team to ensure you have the best stay possible. Through the program, a DelSuites representative thoroughly inspects all suites, to guarantee that it will meet guests’ expectations. “We are committed to having our guests feel like they are at home without the worries of having to take care of their home,” explains Conaty. From confirming that the suite’s appliances are in working order to checking that the bedrooms and bathrooms are clean and well-stocked with linens, the team takes note to ensure that no detail goes unnoticed. But even when something does go awry, Conaty says that guests can be assured that a member of her team, which includes an after hours On-Call Manager, will have the situation rectified within 24 hours or less. As an added bonus, you can also take advantage of the complimentary weekly cleaning services, to help you maintain a well-ordered suite for the duration of your stay. Along with the Points of Perfection program, Guest Services also features an array of benefits that are aimed to make your life easier. 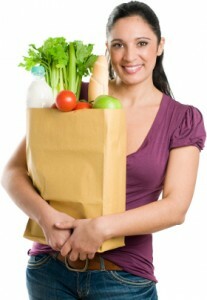 Imagine having fresh groceries placed in your suite before your arrival….so convenient! Imagine walking into a fully stocked kitchen, the very first time you walk through your suite door; while it may seem like an unlikely dream, it can be your reality. “Finding an open market late at night can be a daunting task for even the most seasoned traveler,” explains Conaty. By simply completing the DelSuites online form prior to your arrival, you’ll have all your favourites waiting at your temporary home, no matter what time of the day or night you arrive. In addition to the pre-arrival grocery shop, through a coordinated program with Grocery Gateway, guests can take full advantage of customized grocery shopping services throughout their stay. Groceries ordered through the Grocery Gateway on line service will be delivered to your door, leaving you plenty of free time to relax and use the many amenities the building offers or explore the city. 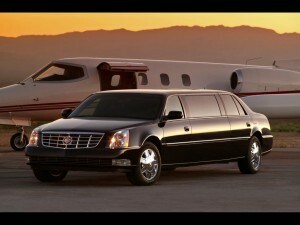 From arranging move-in assistance and airport transportation, the Guest Services Team at DelSuites have you covered. As Conaty confirms, whatever the help you need, her team is ready to assist and is only a phone call away. For any guest service requests or to learn more about the team, click here.